As a tea lover this surprise had me beyond excited. If you are like me, then you will know that finding a good ginger tea is very hard. This is made out of a crystalized ginger and honey mix (no tea leaves), and it is the best ginger tea that I have ever had. It is sweet and spicy; and you can make it hot or iced. And best part, it was a full sized box!! My kids were super excited about these. 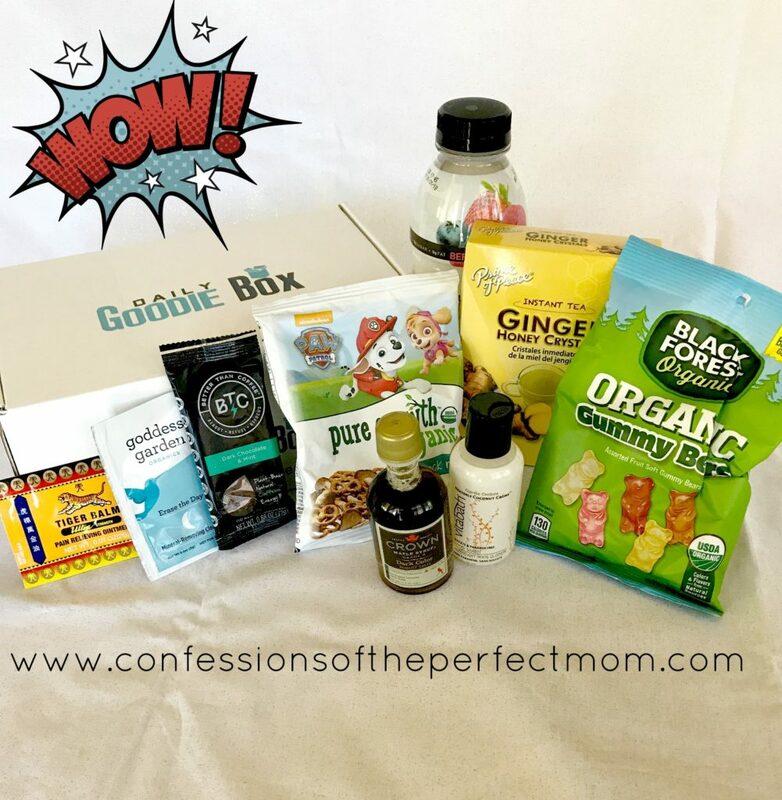 They are actually a staple in our pantry, super easy to grab a bag and munch on a snack. They are pretzels, breadsticks and brown cracker things. But very tasty and I love that there is no artificial flavors, no msn and no trans fat. It was a bummer that by the time we got them, with everything else in this box, there will all crushed up and not edible. The scent of this was perfect for summer. It was Cupcake Couture, Heavenly Coconut Creme; it was certainly heavenly. I have very dry skin, and almost all body washes dries it out further. With this being sulfate and paraben free it did not dry out my skin to much. I was very surprised. The only downfall here is that my kids wanted to use it as a bubble bath, but it says for adult use only? Not sure why that is (in the directions there is nothing about being able to use it for “adult” purposes), so that was a little bummer for them, but then I got to keep it all to myself. So maybe not such a bad thing. Do you love maple syrup as much as I do? I love maple syrup, and this is the real deal. It is dark and thick, it actually reminds me of what syrup would look like straight from the maple tree. And the taste is rockstar. While it is a little on the pricey side, it would be worth every penny. I really wish that there was a way for me to share this taste with you. Okay confession time here: I don’t work out, I don’t go and do hot yoga, I don’t run six miles a day. So really I don’t need to drink protein water. But if you do, this would be the brand that I would recommend. There is 0 sugar, 0 fat, 0 carbs and only 90 calories for the entire bottle, plus it tasted amazing. YEA!! I was literally jumping around when I opened my box and these guys were sitting on top. I am a gummy bear addict. There is just something enjoyable about eating them. Maybe it is a flash back to my childhood treats, or I just like having a candy that I don’t share with my kids. And Black Forest are the best organic gummy bears on the market. Their pineapple flavored ones are my favorite by far. Oh my goodness!!! Don’t eat these close to bedtime, they have a pretty strong punch for getting you up and going. With me being a tea person, and avoider of coffee (ewwww) I did not realize how much stronger coffee is then tea. And this was like an energy drink in my system, without any jittery side effects. I liked the dark chocolate mint flavor, but it was not my husbands favorite. So I have not had a chance to give this one a go yet. But online has some great things to say about this product. But I will update once we give it a try. Yes you read that right out of the 9 products that I received 5 of them were full sized items. All for free! 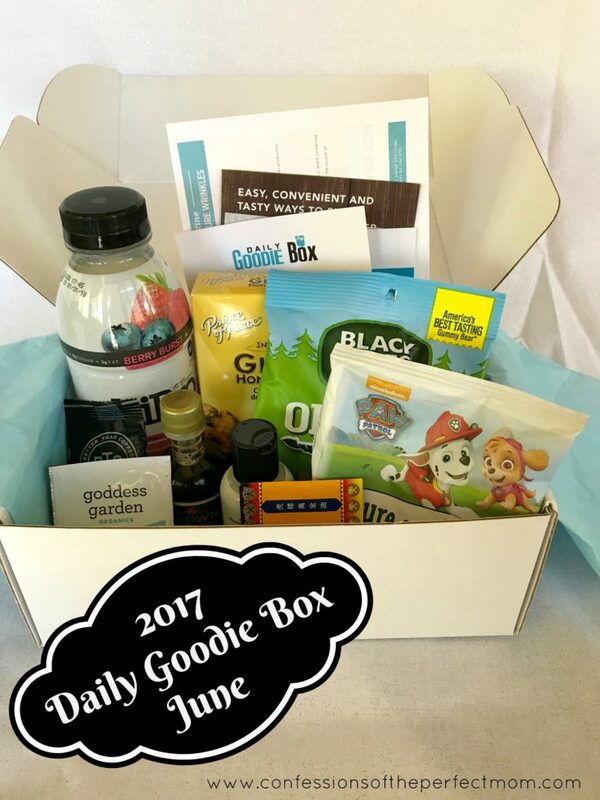 Did you miss my last review of the Daily Goodie Box? Well you can check it out here. These boxes are awesome!! So what are your thoughts? Have you signed up yet? What are you waiting for?